About the time of the arrival of our fifth child I had started taking art seriously. Thus I never made art without having children. I have had to ask other artists, who started into art-making at a younger age, what effect the arrival of children had on their work. I have received two kinds of responses. First, of course (and I have observed this in myself too), is the initial excitement of having a child. Most of my colleagues have been photographers, and their initial response to a child has been the strange confusion between intense personal interest and aesthetic evaluations. They run to friends with their latest photographs, and offer, "Aren't these wonderful?" Their friends tell them, "Yes, but they are just baby-pictures. Nice baby, though." This initial flush of snapshooting wears off, of course. Secondly, a number of artists have confided that the arrival of children had changed the content of their artwork. One said, "Irrevocably." Long standing concerns with formal elements gave way to a more personal content, later shifting to a broader social content. There is a French proverb that goes, The baby gives birth to the mother. When I started out toward an MFA, at an advanced age and with a background completely unrelated to art, I already owned thousands of baby pictures, and had already been transformed into a parent. In addition I was very much aware of the onerous status of family snapshots among those who practice and promote "art photography." I persisted, however, in producing work based entirely on just that -- snapshots of family picnics, children and adults lolling around the house, kids at play -- if for no other reason than to question why this wasn't allowed. It was also unavoidable, for my life was inundated by family and children's affairs and their objects, and since I was still working a full-time job while getting an MFA, I did not have the time, nor for that matter the inclination, to be roaming about the city or the larger landscape in search of formal or aesthetic quarks. Thus the living room, the house, and the backyard became the studio. While I had a small child, the fifth, in the studio, I tried to learn from observation and dialogue something of how an understanding of the world grows. The attitudes, the language, the ability to communicate, and the expectations of power relationships -- all have their genesis in childhood. A complete universe is synthesized, which generally agrees with the social cosmology of others who reach adulthood, and which now allows you to attend to children in turn. It is childhood that holds the secrets of how these expectations form, as it holds the key to the epistemology of language, of form, of relationships. Perhaps art-making itself is but an attempt to reinvoke or rectify these radical conditions, an attempt to reenter a closed territory. We wake up from childhood in our teens or twenties as if from sleep, remembering nothing, and slowly dawning to the realization that all our capabilities as well as the anxieties and doubts of adulthood have been predetermined, set, encoded in our psyche, by the treatment of those who took care of us, or who didn't take care of us, as children. The dark dream which may have been childhood cannot be remembered, but the scars and traumas remain (their secret origins to be divulged, perhaps, through a lifetime of analysis), along with the whole of a developed personality. Since our own childhood is closed to us, the artist who has a child in the studio is privileged. For here is a chance to learn something of how this cosmology is formed. To this end I started to transcribe babble at age 1, and kept vocabulary and phrase lists at ages 1 through 2. I made posed portraits of "occupations" at age 4. I collected and photographed masks made through age 5. Once, when I exhibited these, I was asked by the child to add the statement, "Return them soon, John, after you show them to your artists, I need them every day." He was in his mask phase. Also, for 7 years we turned over to him every cereal box, toilet paper tube, tin can, and cardboard box that came into the household. Once a week we went to the hardware store for two more rolls of masking tape. All this material went into what were called "constructions." Other children in the neighborhood would bring to their parents astounding stories about the wonderful toys our child had. None of the children at first believed that all of these objects were only cereal boxes and milk cartons held together with tape, although the labels were plainly visible. The reality of these constructions was set in the imagination, where all their working attributes stood described. But then, we always presumed the real existence of the fantasy; we never asked, "What is that supposed to be?" We asked,"What is that?" At age 9 we finally cleared the attic of the accumulated "constructions," and compressed them to six cubic yards of cardboard space ships, ray guns, swords, hats, communicators, helmets, camcorders, power packs, transducers, control panels, vending machines, and robots. I photographed many, measured them, wrote down descriptions of their various features, saved a few. The construction phase -- where it was important to immediately reconstruct whatever has been seen or imagined -- had ended. Childhood is brief; and the phases of learning language, or of developing a dexterity with form based on cereal boxes, are even briefer. They are too short to allow proper inquiries to be made by an adult whose attention span cannot stretch to twenty four hours a day, who has other things to do. I still do not know how certain skills were learned. This child, for example, taught himself to read, but I cannot pinpoint how it was done. We never spent time with letters or word lists, although we always took the time to write out for him the labels he requested for his robot control panels and spaceship instrumentation. It is difficult to believe that he learned to read simply from observation, from the example of his mother who read a story to him every night for ten years. What I learned in turn from the child in the studio was also by example. I have marveled at the absolute simplicity of drawn or cutout figures, or the occasional assemblies of raw materials that were exactly appropriate to their use. 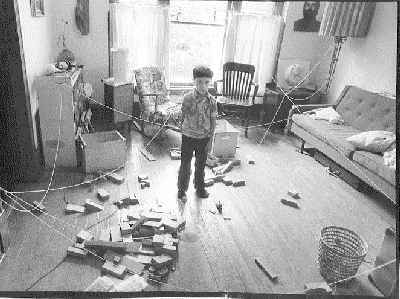 I have followed up on many suggestions made by children -- a giant spider web across the back porch was an example, and the suggestion for a Robert Frank Coloring Book. But much of childhood remained a hidden territory, and, as I had started to find out, it also remains forbidden. When I first started out in photography and art, Emit Gowin's early production of snapshot-like viewcamera photographs of his wife and children ("Emit Gowin - Photographs" 1976), was a model for what I wanted to continue to explore also. But Gowin never managed to clearly express why he was doing what he did, and never seemed to exhibit an awareness of how his work was being received. His photographs may have been loved by curators and collectors, but they often confused and ultimately infuriated other photographers. The work's admission to the canon of fine art was felt to be unwarranted by some of his peers although it was difficult to fault the beautiful photographs. The work evoked no small amount of envy also, for it seemed completely unreproduceable to other photographers, who looked upon their lovers or spouses, their children, and their homelife and saw nothing that came close to the rustic nudes being made by Gowin. On the lecture circuit Gowin had difficulty fielding the couched questions addressed to him, and it began to look as if he could simply not justify what was starting to be called an exploitation of his family. Alan Cohen's scathing review in 1977 ("The true story of a family album -- in spite of good intentions" Washington Star, 2/4/77), which leveled the accusation that the photographs represented an empty and false Romanticism, suddenly verbalized for others in the photo community this deep-seated anger and frustration. Cohen was astounded at the number of letters he received in response to his article. Gowin eventually stopped presenting his family in photographs, and turned to landscapes. I continued with snapshots for longer, but eventually also had to turn to other topics. One reason for this was that whereas I thought I was dealing with questions of epistemology, I was instead becoming identified with the genre of "family photographs," and that just wouldn't do, for this label was simply an undercutting marginalization. "The Family" was held to be a non-topic, and included no territory for radical investigation. I now think that this is because we don't want to be reminded of how dreadfully dysfunctional our own growing-up experiences were. Another negation of childhood is to falsify the identity of the territory by hiding it under layers of undue sentimentality. Any artwork involving family and children is all too easily read by others as this sort of romanticized falsification -- something I also wanted to keep separated from. I also think that this abhorrence with childhood shows in much of current art-making, by presenting social and gender issues as if they are sprung fully armed upon us as adults. Another reason for moving to other topics is that as children grow older, concerns expand from the immediate relationship with them to a broader outlook. You might consider the safety of a neighborhood for a 5-year old, but for a 15-year old you think about the city, and with a 25-year old you become involved in topics of national concern. One of my kids is in Saudi Arabia. For a recent exhibition in Chicago ("The Foreign Policy Show"), I put up an installation of small bombs stacked on layers of glass. These were the same bomblets he played with when he was a teenager. He once with great diligence and patience set 1200 of them up for me in neat rows on the kitchen table for a photograph. The task was started after lunch and completed before supper, when the table had to be cleared again. I wondered, as that show went up, what his feelings were currently -- on the war and on the military. These are concerns that are no longer delimited by childhood. None of the kids have turned to art as a career. They have become surveyors, and computer programmers, and nurses, and waitresses, and some are still opening and closing doors on various options. They have learned some patience and appreciation with art. Some have learned to say, "Nice piece," when appropriate. But I don't think any of them yet understand the drive and purpose behind the activity, they are still too close to childhood for that.